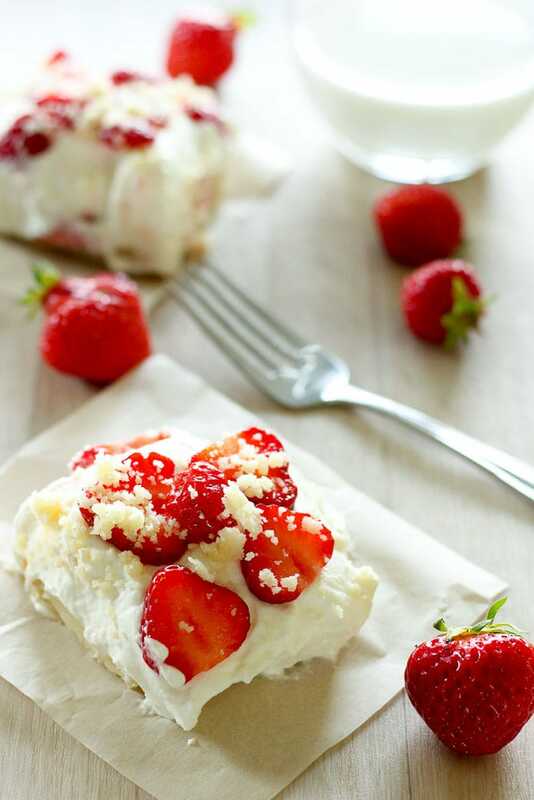 These Fresh Strawberry Shortcake Bars combine a rich, buttery shortbread base, a fluffy vanilla cream and fresh summer strawberries into a heavenly summer dessert. 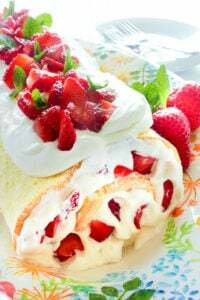 Easy to make and completely addictive, they’re the perfect plan for all those sweet strawberries you have in the fridge. They are delicious. I’m a sucker for shortbread and the base is buttery and flaky. The vanilla cream filling is light fluffy and a little bit rich. And the strawberries are sweet and tasty. They’re flexible. You can make this recipe in an 8X8 square baking dish. You can make it in a 9X13. You can make it in a tart pan if you want. It will, of course, change the outcome, but every outcome will still be delicious. The 8X8 will make for a thicker base and filling and it’s a bit more decadent. The 9X13 will let you stretch this recipe out for a crowd. The only difference in ingredients is that you’ll need more strawberries if you want to completely cover the top of the 9X13. But you could always scatter what you have around. 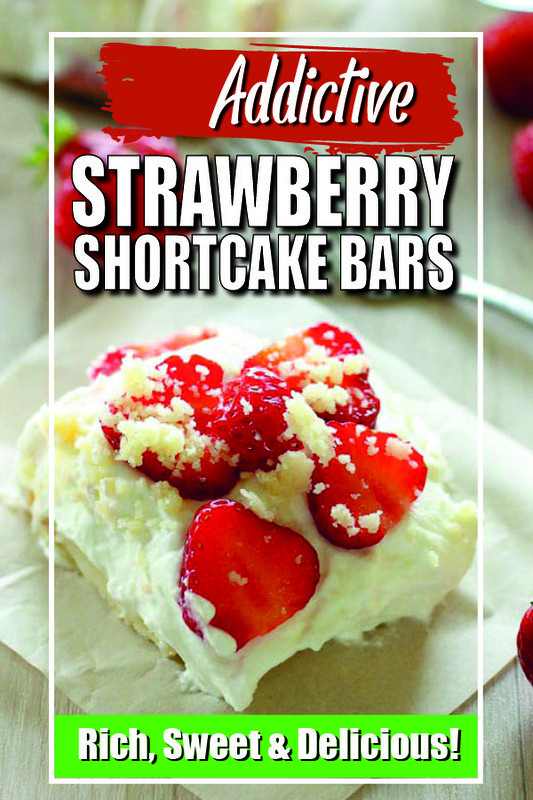 These are called Fresh Strawberry Shortcake Bars for a reason. 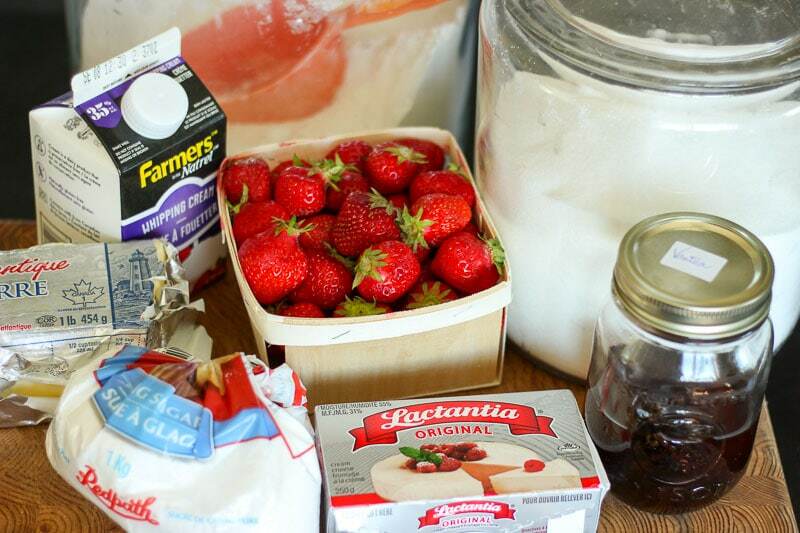 This is a recipe to save for summer’s sweetest berries. 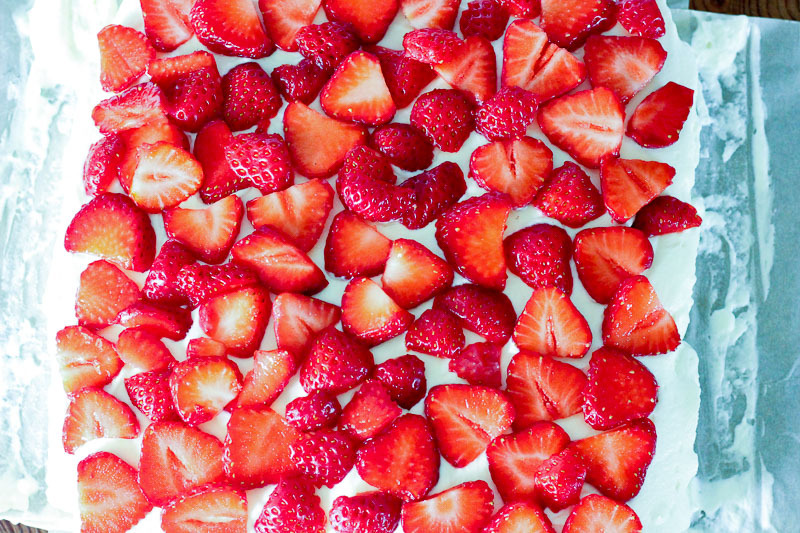 Those baskets of berries that waft intense strawberry flavour over at you from the counter. That’s when these will be at their best. 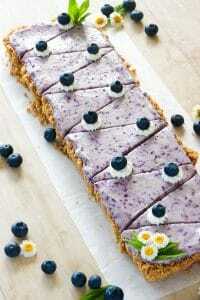 Also, this would be super delicious with other blueberries, raspberries or blackberries, or a mixture. Any really fragrant and fresh fruit! Just make sure the fruit isn’t too wet. So that’s it! I can’t really think of anything else you need to know. Oh wait – yes! In my experience these are not as much of a handheld bar as they are a bar or square that you need to eat with a fork. Just so you know! 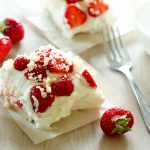 These Fresh Strawberry Shortcake Bars were somewhat inspired by Laurier’s favourite ice cream when he was growing up – you can see the modern equivalent here. They’re not the same, but this is a grown up, fancier version. Yum. Don’t be scared off by all the instructions. It’s mostly just me blathering on about options. These bars are really easy to make. This step is totally optional but I want to include it. 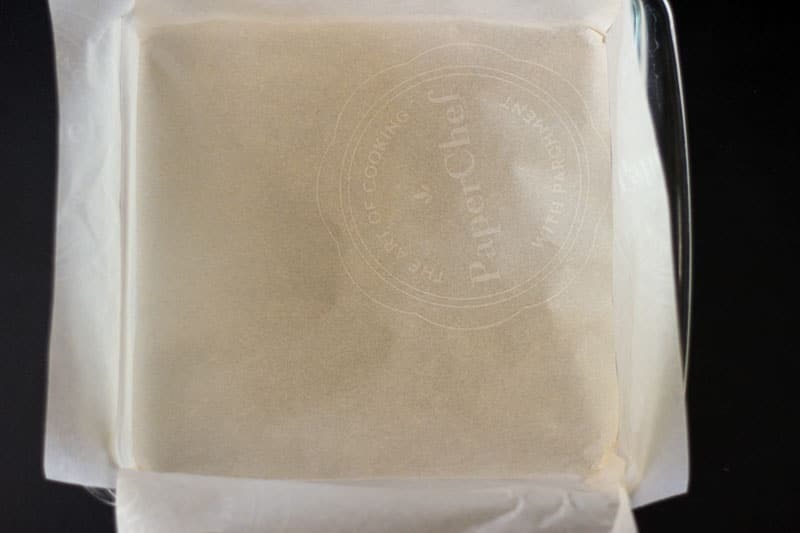 If you plan to use an 8X8 baking dish and want to lift your bars out of the dish so you can cut them in a neat and pretty way, you’ll have to line it with parchment paper. I cut two strips of parchment paper the width of the dish and layered them opposite to each other with the ends hanging out (to give me handles to lift with later). I don’t think you could do this with a 9X13 because it would be too big. Don’t overlook a pretty tart pan for this recipe either though. Melt 1 cup of butter (I find the microwave is fast and easy). In a large bowl combine 2 cups of flour with 1/4 cup of sugar. Add melted butter and stir until combined. 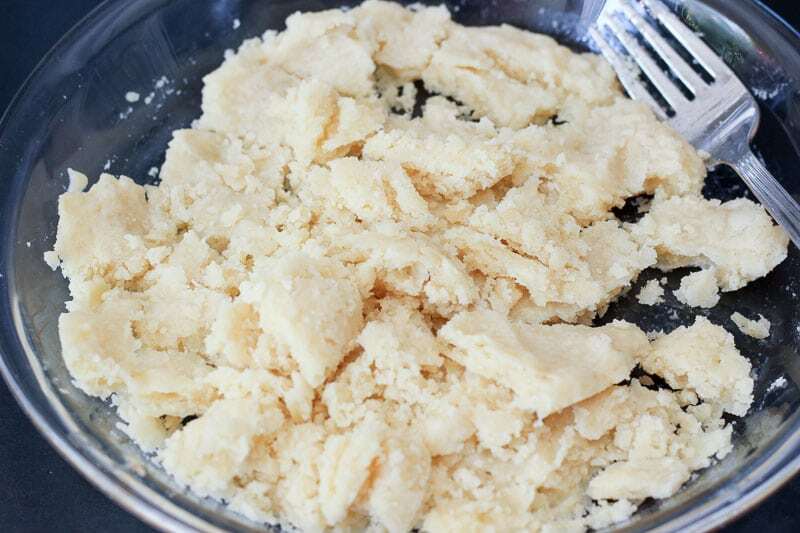 Press about 90% of the shortbread base into the bottom of your pan. Then use an empty pie plate or other kind of baking dish to put the rest (in this photo I saved way more than I needed for the pie dish – leave much less). This will make up the crumbly topping. Feel free to skip this step if you don’t want the topping and just use all the shortbread for the base. Like I said, this is a flexible recipe. Bake both dishes (if you’re making the topping too) in a preheated oven for 8-10 minutes. If you’re using a 9X13 pan it will probably be more like 8 minutes but for a 8X8 pan it took 10 minutes. When you check on it you’re just looking for the tiniest hint of light browning around the edges – then you’ll know it’s done. You might need to bake the topping an extra minute or so to firm it up a little more. When it’s done, remove it from the oven and cool completely. 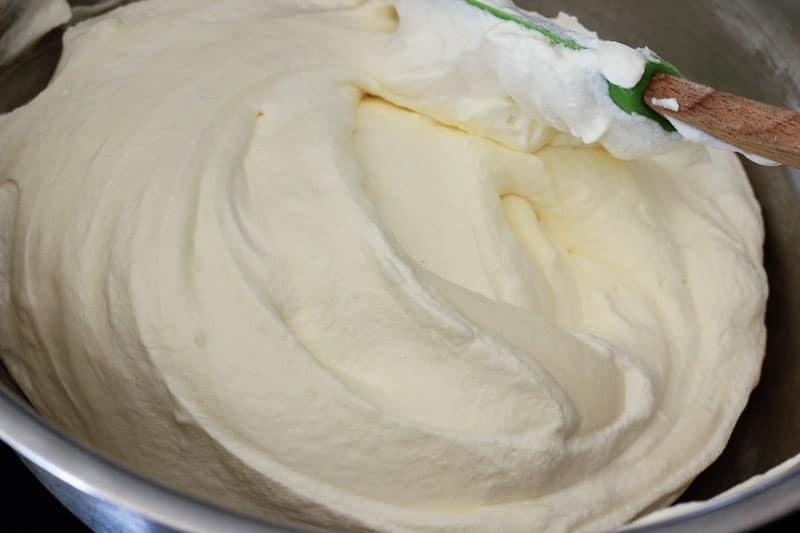 Meanwhile, whip 2 cups (or a medium sized container – for me that’s actually 473 ml which is not quite 2 cups but close enough) of heavy (35%) cream in a large bowl until stiff peaks form. 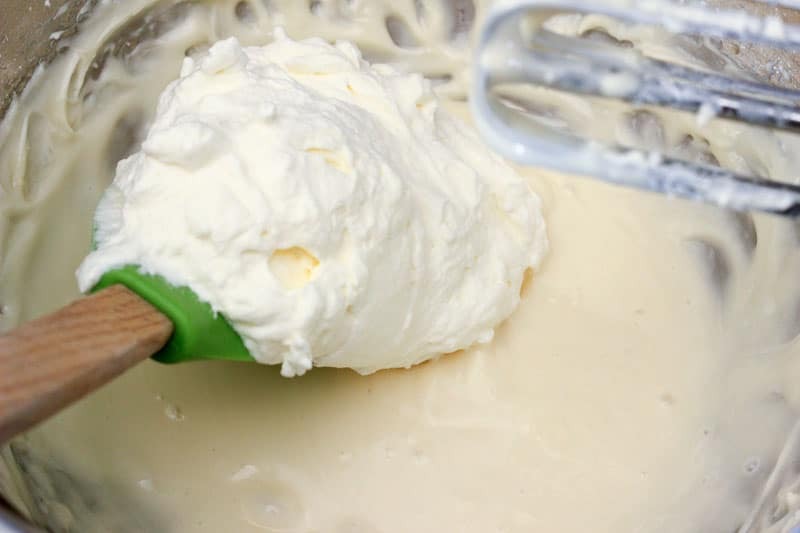 In a separate large bowl, use a hand mixer to beat 1/2 package of softened cream cheese (1/2 cup or 125 g) until very creamy. Add 3/4 cup icing sugar and 3 tablespoons of vanilla (I like a really vanilla-y taste). Mix until creamy and well-combined. 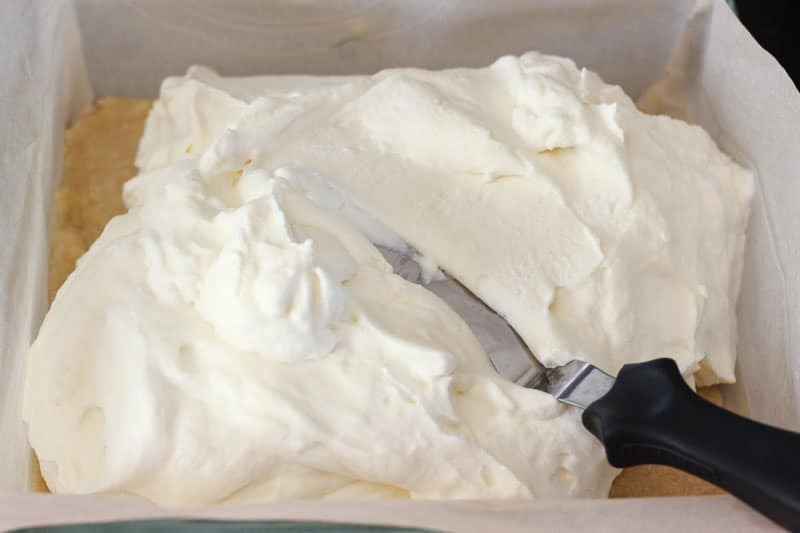 Add a large scoop of the whipped cream and use the hand mixer to beat it into the cream cheese filling. Then fold the rest of the whipped cream in, trying not to crush its fluffiness (IT’S SO FLUFFY!!!). Spread filling over baked and cooled base and refrigerate to let it set a bit – at least 30 minutes. After it’s set you can use the parchment paper handles to lift it out of the pan if you’re using this method (or just leave it in the dish if you’re not). 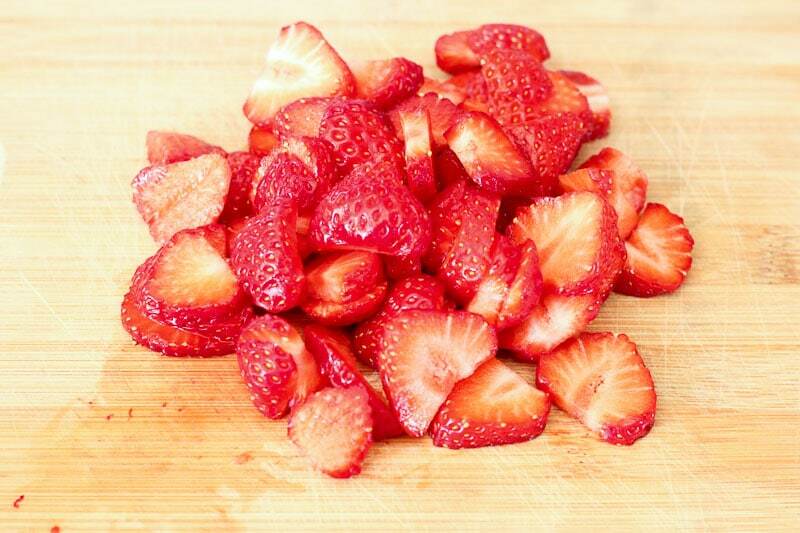 Meanwhile, rinse 1.5 – 2 cups of strawberries and pat them dry. Slice them for the topping. Remember the topping we made earlier? It should be cool now. Use a fork to break it up into pieces (remember that this photo has way more topping in it than you’ll need). 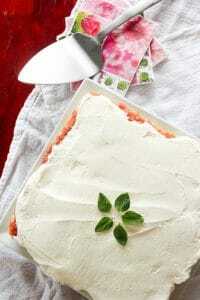 Spread sliced strawberries over chilled filling. If you use a bigger pan you might end up doing more of a scattering. 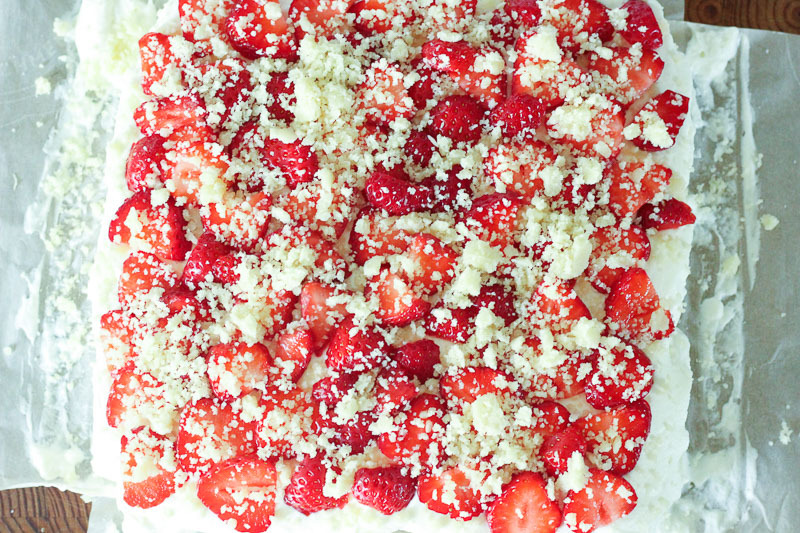 Use your hands to crumble the topping over the berries. Cut and serve. 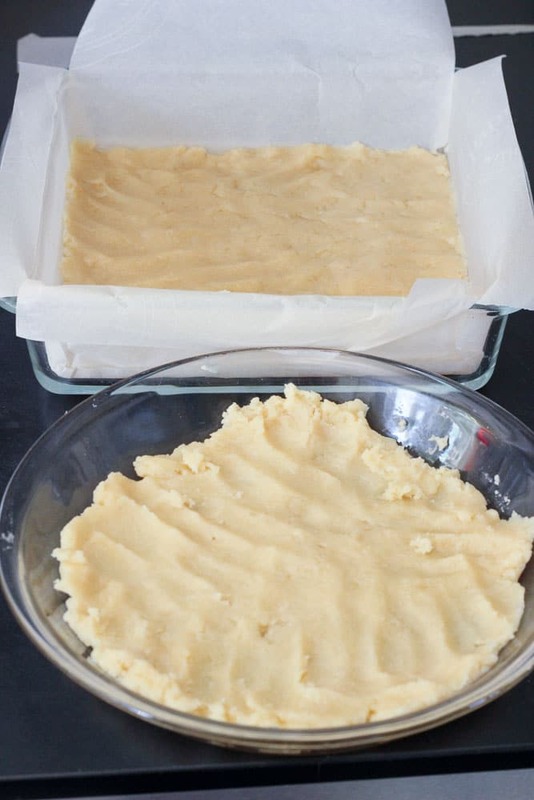 This step is optional: If you plan to use an 8X8 baking dish and want to lift your bars out of the dish so you can cut them in neatly, you'll have to line it with parchment paper. Cut two strips of parchment paper the width of the dish and layer them opposite to each other with the ends hanging out (to give you handles to lift with later). I don't think you could do this with a 9X13 because it would be too big. Don't overlook a pretty tart pan for this recipe either though. Melt butter in microwave. 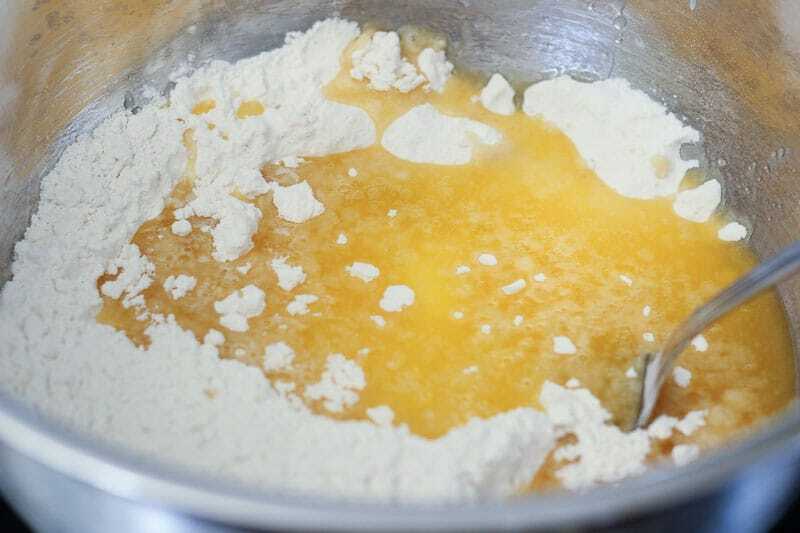 In a large bowl combine 2 cups of flour with 1/4 cup of sugar. Add melted butter and stir until combined. Bake both dishes (if you're making the topping too) in a preheated oven for 8-10 minutes. If you're using a 9X13 pan it will probably be more like 8 minutes but for a 8X8 pan it took 10 minutes. When you check on it you're just looking for the tiniest hint of light browning around the edges - then you'll know it's done. You might need to bake the topping an extra minute or so to firm it up a little more. When it's done, remove it from the oven and cool completely. 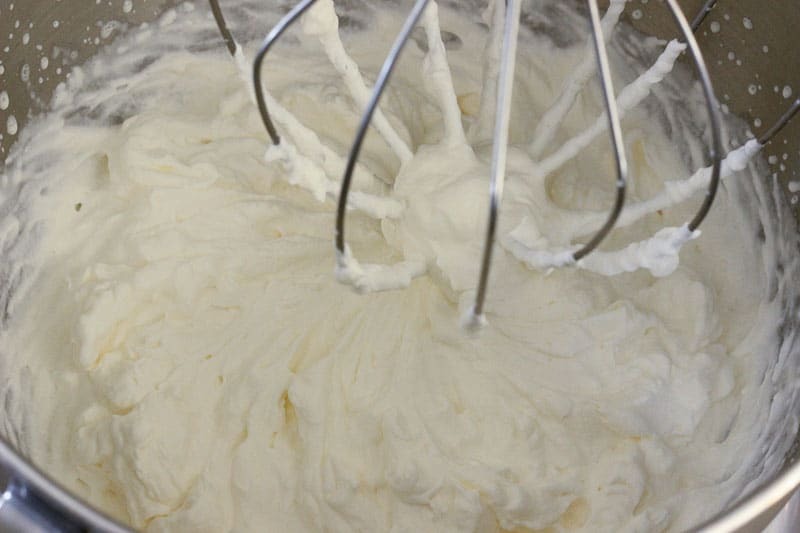 Meanwhile, whip heavy cream in a large bowl until stiff peaks form. 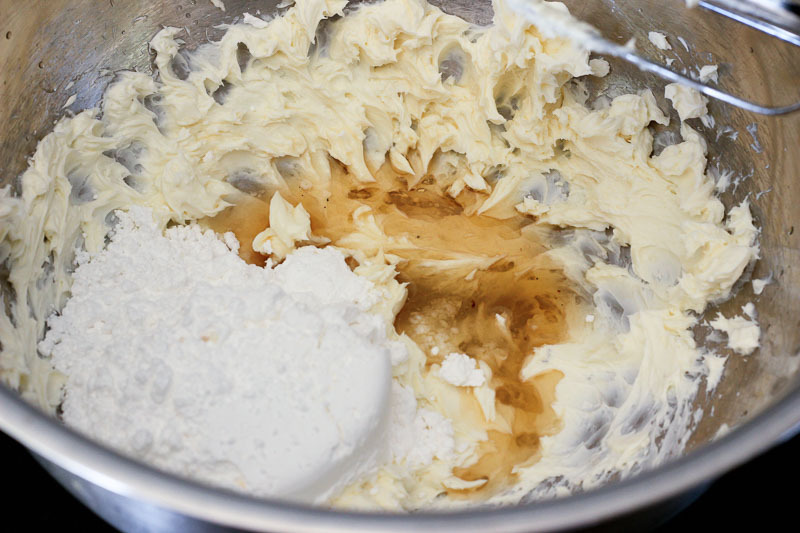 In a separate large bowl, use a hand mixer to beat softened cream cheese until very creamy. Add icing sugar and vanilla. Mix until creamy and well-combined. Then fold the rest of the whipped cream in, trying not to crush its fluffiness. Spread filling over baked and cooled base and refrigerate to let it set a bit - at least 30 minutes. After it's set you can use the parchment paper handles to lift it out of the pan if you're using this method (or just leave it in the dish if you're not). Meanwhile, rinse strawberries and pat them dry. Slice them for the topping. Remember the topping we made earlier? It should be cool now. Use a fork to break it up into pieces (remember that this photo has way more topping in it than you'll need). If you like the recipes and tips we’re sharing, please subscribe our our newsletter! You’ll receive a copy of our e-book, $5 Meals – available exclusively to our subscribers!